Mailbag: For Two Marches, Different Causes, Different Complaints : NPR Public Editor Coverage of the Women's March and the March for Life raised questions about crowd size and language. The Women's March passes by the U.S. Department of the Treasury in Washington, D.C.
Last weekend was a very busy one for the NPR newsroom. Between the Inauguration of President Donald Trump and the massive Women's March demonstrations, there was no shortage of news. We heard from listeners and readers about all aspects of NPR's live coverage of Inauguration weekend, including a number of concerns that NPR did not adequately cover the Women's March. "Yesterday, I turned on NPR to hear coverage of the Women's March. Instead, NPR was airing an interview with a Trump supporter about some banal aspect of the inauguration. When a news organization does not recognize that millions of protesting marchers are a newsworthy event, that organization has ceased to be relevant." In our review of NPR's coverage, the Women's March dominated the news cycle on Saturday and well into Sunday. Twenty of the 24 hourly newscasts in the 24-hour period starting at 6 a.m. Saturday led with updates from the Women's March in Washington, D.C., as well as around the country and world. Overall, 13 NPR correspondents and member-station reporters filed reports from marches across the U.S., including Raleigh, N.C.; Los Angeles; New York City; St. Paul, Minn.; Wichita, Kan.; and Seneca Falls, N.Y., as well as from those in London, Sydney, Brussels, and Mexico City. The weekend newsmagazines dedicated the majority of their show reports to the march, as well. Weekend Edition Saturday had insight into plans and preparation, as well as live updates from demonstrations in Washington, Boston and Raleigh. Later that afternoon, All Things Considered dedicated four segments to the march. By our count, NPR produced 29 pieces on the Women's March on the newsmagazines and online over the Friday-to-Sunday timeframe, a considerable effort. As always, the newscasts change and update hourly, and are not archived by transcript on the NPR website. So listeners tuning in for just an hour might not hear the breadth of coverage. We also heard from many listeners concerned by the vague estimates of crowd size on Saturday. "I listened to NPR for several hours on Saturday, 21 January 2017. More than once, during the hourly newscasts, I heard the size of the Women's March in Washington DC reported as being in the 'tens of thousands.' The impression that I get from people who attended the rally and march is that the number of participants was actually in the hundreds of thousands and other media report it as about half a million. How did NPR arrive at such a low estimate for the crowd size?" "Tonight I listened to the NPR news summary that I often listen to via podcast. I was disappointed in the reporting around the women's march in Washington DC. I have participated in countless large protests around the US. My estimation and those of my colleagues who are expert on the matter think that there was somewhere near 1 million people or more at the rally and march today. NPR said 'thousands of women.' That is an insult to all those who took time to participate in the activities. Even saying tens of thousands would be an insult or hundreds of thousands is still not accurate as I believe it was either nearly 1,000,000 or over 1 million marchers. And if you look around the country and around the world it was clearly millions of people resisting." Indeed, NPR reports gave the crowd-size estimates as being in the "thousands" early on in the day. During the 1 p.m. newscast and onward, the language began to shift to "hundreds of thousands." This caution was in accordance with NPR policy on estimating crowd sizes. Shortly before the Inauguration and the march, NPR's standards editor Mark Memmott advised reporters to "stay away" from claims of crowd size by partisans. In a memo, Memmott told the newsroom to "focus on describing the crowds — how far they stretched, how much of the Mall they covered, how many deep they were along the streets, how crowded the Metro was, etc. We should not cite the numbers coming from those partisans as if they're real. They're claims." Robert Garcia, executive editor for newscasts, told me that, without citing figures, NPR "found other ways to describe the enormity of the event and made constant mentions of the rallies occurring throughout the U.S. and the world." Claims of crowd size are often disputed, and the subject has been especially fraught given Trump's preoccupation with the size of the crowd at his inauguration. Former ombudsman Edward Schumacher-Matos questioned the ethics of blindly reporting claims of crowd size in a column following the People's Climate March in New York in 2014. In fact, the National Park Service no longer provides crowd estimates, and local police departments often are reluctant to cite hard numbers, so getting an undisputed, "official" count is not always possible. 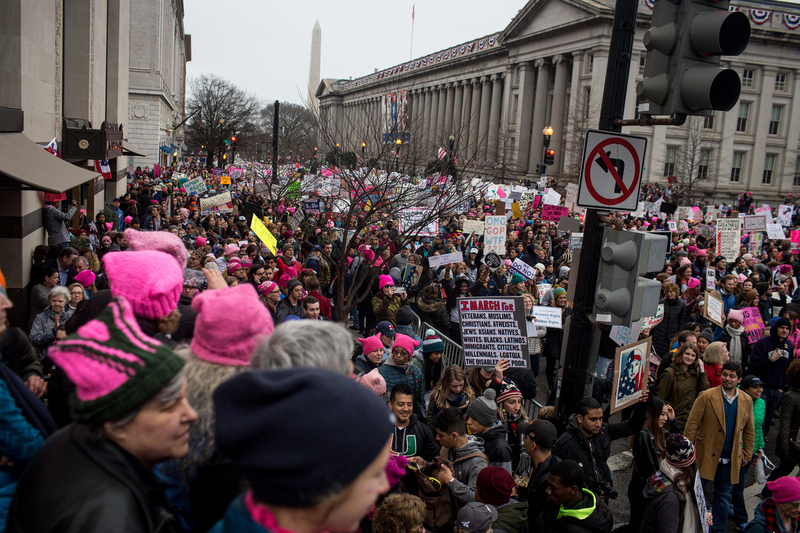 Jon Hamilton expanded on how difficult it is to count crowds on All Things Considered on Monday with an interview with a crowd scientist and the chief executive of Digital Design & Imaging Service, which was working on an attendance estimate of the Women's March in Washington. The resulting estimate: "Some 440,000 people were on the National Mall and surrounding streets." Also, by Monday, it should be noted, with more data coming in, NPR was fully reflecting the magnitude of the multiple marches, referring to the "millions of people" who marched worldwide. "Editorialists are expected to restrain themselves from misrepresenting positions with which they disagree. Yet Windsor Johnston (today at 12 noon news hour) and other NPR reporters consistently say 'abortion rights opponents' rather than 'pro-life advocates.' Why? This type of labeling clearly indicates NPR reporters' bias against those whose convictions they oppose. To label as you do is not accurate and it is not ethical." "On the air, we should use 'abortion rights supporter(s)/advocate(s)' and 'abortion rights opponent(s)' or derivations thereof (for example: 'advocates of abortion rights'). It is acceptable to use the phrase 'anti-abortion rights,' but do not use the term 'pro-abortion rights'. Digital News will continue to use the AP style book for online content, which mirrors the revised NPR policy. Do not use 'pro-life' and 'pro-choice' in copy except when used in the name of a group. Of course, when the terms are used in an actuality they should remain. Former NPR ombudsman Schumacher-Matos explored the issues around the language in a 2011 column, writing, "In an attempt to be fair, NPR and much of the mainstream news media now use the more neutral phrases 'abortion-rights advocates' and 'abortion-rights opponents' in place of 'pro-choice' and 'pro-life' as labels for the opposing sides." Ombudsman Elizabeth Jensen contributed to this report.